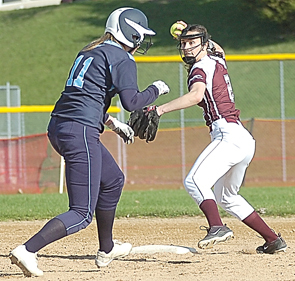 Staff photo by Travis Rosenau Jordan Rettig of GFW makes her way to third in the first inning of Friday’s nonconference game with Nicollet as Nicollet’s Brooklyn Gohr throws to first for an out. 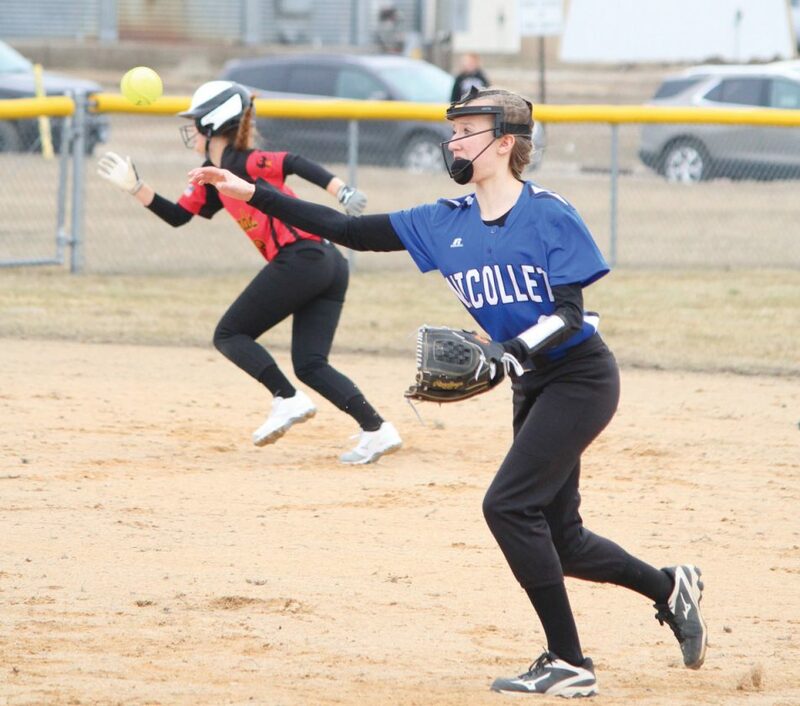 NICOLLET — Hayley Selby had her pitches and bat working against Gibbon-Fairfax-Winthrop on Friday at Nicollet High School, giving Nicollet a 10-0 shutout win in five innings of nonconference softball action. 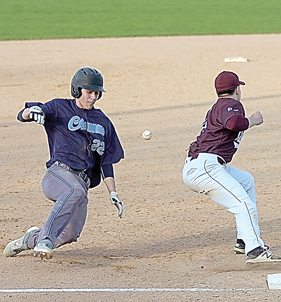 Selby went 2 for 3 with four RBIs at the plate for the Raiders. She also picked up the win in the circle, pitching five innings and allowing three hits and a pair of walks. She struck out four batters. Also for the Raiders, Marah Hulke went 2 for 2 with three runs scored, a pair of walks and a pair of steals, while Anna Holmin went 2 for 4 with an RBI and a run scored. Kassidi Gomez went 2 for 2 with a walk and a pair of runs scored for Nicollet. Jordan Rettig took the loss for the Thunderbirds, pitching 4 1/3 innings and allowing nine earned runs on 11 hits and seven walks. GFW was led by Lexi Rettig with a double, while Jordan Rettig and Morgan Aylsworth added a single each. Nicollet added its first run of the game in the bottom of the first inning after Selby brought in Hulke on an RBI double. Jordan Rettig had things under control for the most part in the next two innings before the Raiders started to get the small ball to work, leading to four runs. In that fourth inning, Gomez got a one-out single before Hulke and Brooklyn Gohr dropped down a pair of bunt singles, with Gohr’s scoring Gomez. Selby then drove in Hulke and Gohr on a single before Emily Bode reached on an infield single. Marisa Arndt then walked to fill the bases before Alysha Strunk drove Selby in on a base hit for the final run of the inning and a 5-0 lead. Nicollet then put things away early in the bottom of the fifth, drawing three walks in a row before Holmin knocked in a pair of runs on a single to right field. A wild pitch then scored Gohr, who walked earlier, before Selby grounded out to score the fourth run of the inning. Back-to-back walks filled the bases again for Nicollet, and that allowed Olivia Whitmore to get her first hit and RBI of the game to end things in five. 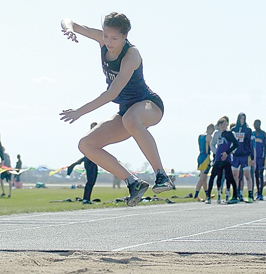 Nicollet (1-0) is at the Cleveland Invitational Tournament at 9 a.m. Saturday, while GFW (0-1) is at Springfield for a 5 p.m. Tomahawk Conference game on Tuesday.